On Tuesday night Ballymena Runners swapped their normal vests and shorts for beards, hats, white fur trimmed red jackets, trousers and broad buckled belts as they embarked on the annual Santa Run around the streets of the town centre as a fundraiser for TinyLife. 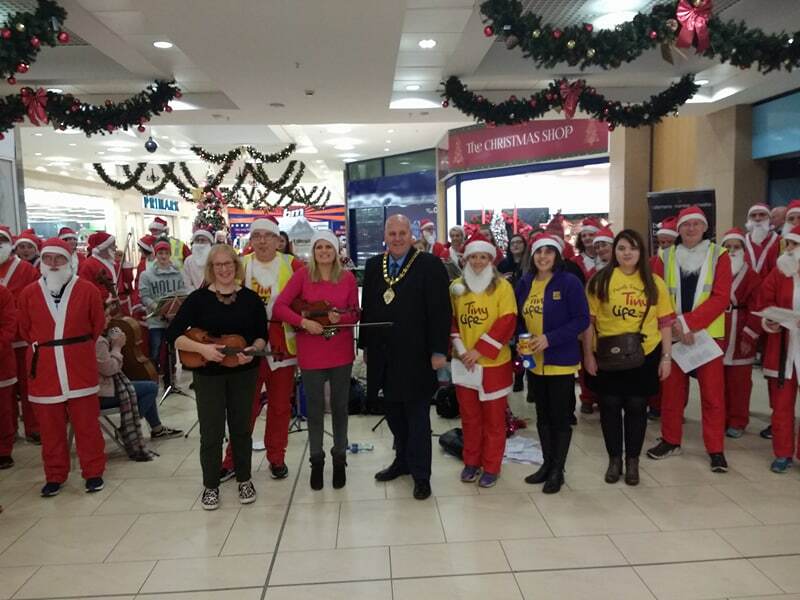 Leaving from Montgomery's on Ballymoney Street the 50-strong contingent made their way into the Tower Centre to regale the throngs of Christmas shoppers with some festive tunes, ably assisted by the Ballymena Chamber Orchestra and Mayor Cllr. Paul Reid. From there this sleigh of Santa's stopped traffic and turned heads as they made their way up Wellington Street and down Church Street on their way to the Adair Arms Hotel for some refreshments before making the return journey to the bandstand at Broadway for a spot of carol singing beside the tree ahead of some much needed nourishment back at Montgomery's. In total, an amazing £890 was raised for TinyLife (formerly NIMBA), Northern Ireland's premature and vulnerable baby charity, dedicated to reducing premature birth, illness, disability and death in babies born here. The club would like to extend a huge thank-you to everyone who donated on the night for their generosity at this time of year.